Lawson Wagner deals from the side, but his results were over the top. 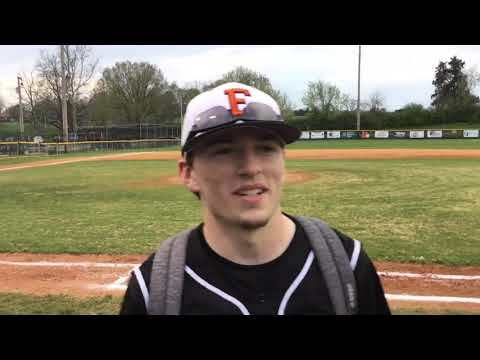 Elizabethton’s sidearm specialist kept David Crockett off balance from start to finish, and the Cyclones delivered an 11-0 mercy-rule baseball win Friday at Miller Park. It was the sixth straight win for the Cyclones, who improved to 16-4 on the season. David Crockett fell to 6-12. Wagner (3-0) never flinched on the mound, holding Crockett to two hits. He didn’t allow a hit until the fourth inning, and didn’t walk a batter while striking out three for the game. Wagner said his throwing motion is comfortable. Presnell said Wagner was tough against a good-hitting team. The hits were few (6), but the runs were many (11) for Elizabethton. Evan Perkins had one of the most interesting batting lines that can be produced. He was 1 for 1 with four RBIs without an extra-base hit. He drove in two runs with a first-inning single, added a sacrifice fly in the third, and was hit by a pitch with the bases loaded in the fifth inning. Matthew Dailey totaled two hits and three RBIs while leadoff man Karson Dillard also added three RBIs. The Cyclones stole six bases in the game, including two each by Evan Carter and Perkins.